Art's oldest boy was living in Arizona, and saw through an open gate a yard full of Dodge Town Wagons. 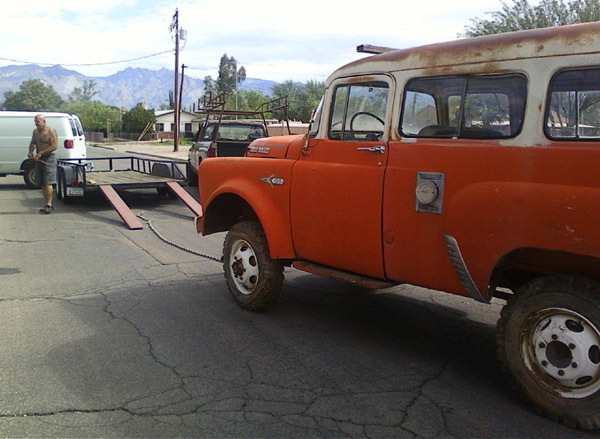 He finally met the owner, and found out the owner was about to take them to the scrap yard. He didn't have time to work on them, and his kids all wanted racers. 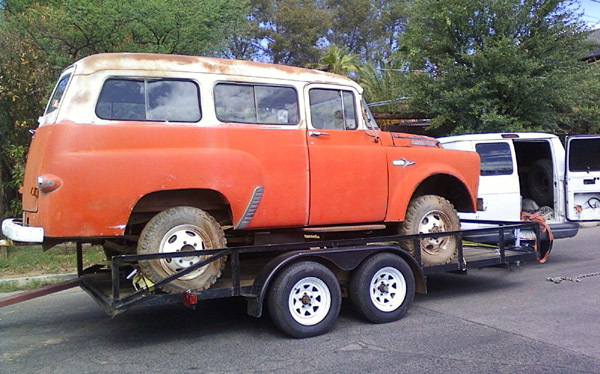 He bought the '57 and his son loaded it up and drove it to Rockford. Originally, the truck was a winter rescue vehicle in the Denver area until sometime in the 1970's. As was the custom, the rear wheel wells were opened up (looks like with a can opener) and a set of dually wheels were installed. The truck had a Propane heater installed in back of the driver for added warmth, and the air intake and vent are still in the side of the truck. The next owner thought he was a hot rodder, and had someone hack in a 440 - 727. Art does mean hacked, frame repairs and removal of the added subframe was several weeks of solid work. Art sold the 440, as it did not fit between the frame rails, and he wanted something more reasonable. Art found a rusted 1987 Ramcharger with no floor for $800, and stripped it of everything he could. The '57 now has a nice 318 - 727, and from what little he has driven it, it runs great. The original '57 axles are D-44 in front and 8.75 rear. The wheels are an oddball 6 (5/8 bolt) x 7.25 hub with 17.5"x6 wheels. Brake drums are not available (two year search) tires are $300 each if available. The new axles are 1979 D-44 front and 9.25 rear. Discs and drums are available from every auto store in town.